In the garden, amaryllis appear in the early Spring so I associate them with Aries. They represent “pride” in the language of flowers and, as far as I’m concerned, have every right to do so. Last year, my favorite garden blogger ~ dirtynailz at DiggingRI ~ had a discussion about amaryllis. I promised a nice photo if mine did well last year, which they didn’t. This year is another story, though! They brighten a corner of my garden and greet me each morning as I step out onto my back porch. My husband calls them the horn section. 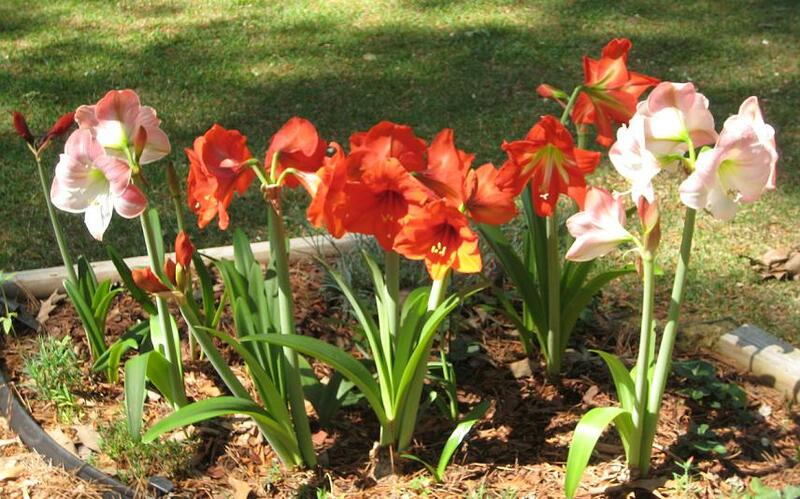 Amaryllis bulbs arrive in the early winter so they can be forced to bloom for the holidays. The tubular flowers are absolutely stunning and stay beautiful for a long time. Here in Zone 8, it’s a snap to transplant them into the garden. Almost all of these are transplants. Mine are reproducing at a fantastic rate this year. Is it too early to look forward to next Spring? To say they “brighten” that corner is putting it mildly, CJ. They are over-the-top stunning!